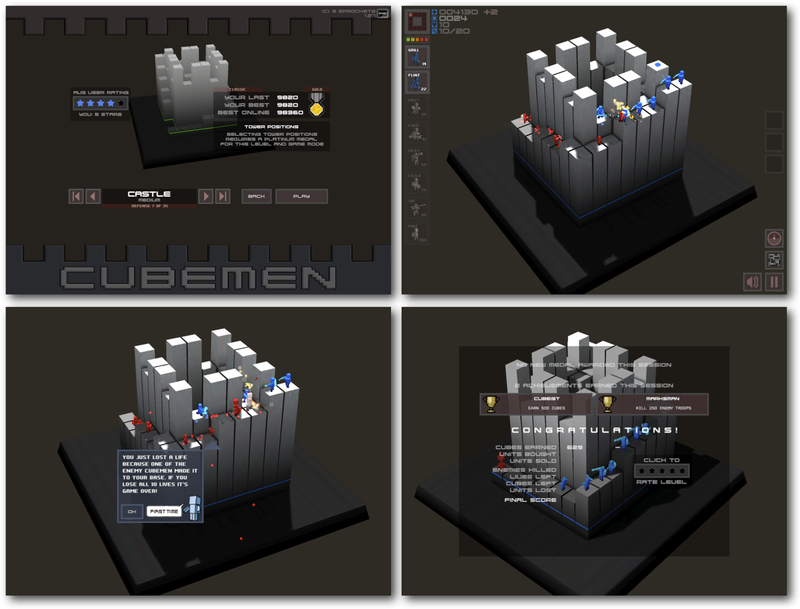 Cubemen ($1.99 iPad, $1.99 Mac) is a cross between a tower defense game and a realtime shooter. 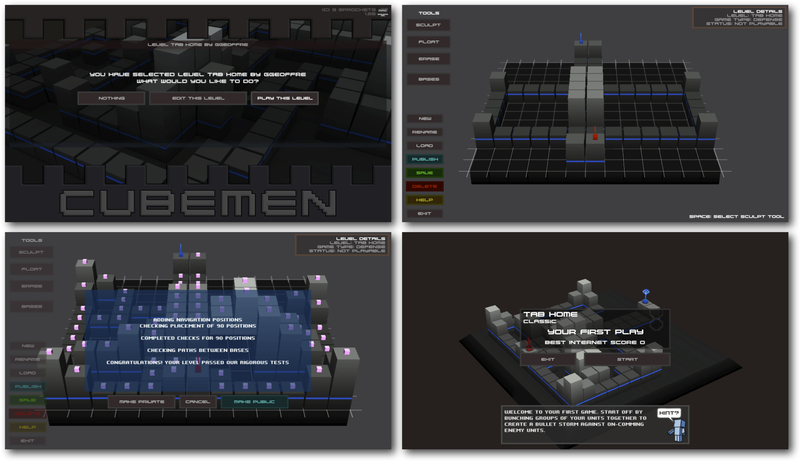 In control of an army of cubed men, you face off against either the game’s artificial intelligence or an army of online faceless foes. It’s one of the few games available in the App Store that has managed to implement multiplayer gaming across different platforms, iOS, Mac and Steam. 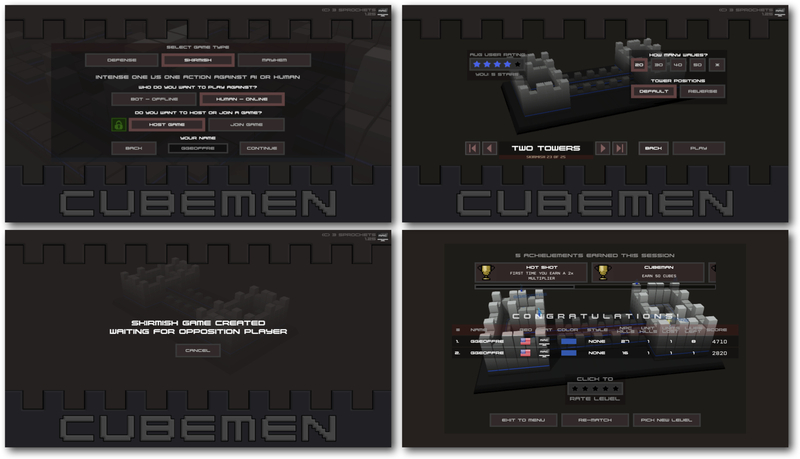 Since it is a tower defense game, you are not only in charge of every member of your team, you are also responsible for picking what types of Cubemen will be on your team. With each challenge you and your opponent start out with an empty playing field. There is a point system that awards you with each kill on the battlefield. These points are used to purchase additional Cubemen mercenaries for your team. The more powerful and destructive the Cubemen, the more they cost. Some have flame throwers, mortars, canons and a laser. There is even a medic that will heal your players as they get injured. Once you decide which type of Cubemen you want to deploy, you simply tap the square on the battlefield you want them to defend. In the game, there are three basic modes of gameplay: Defense, Skirmish and Mayhem. 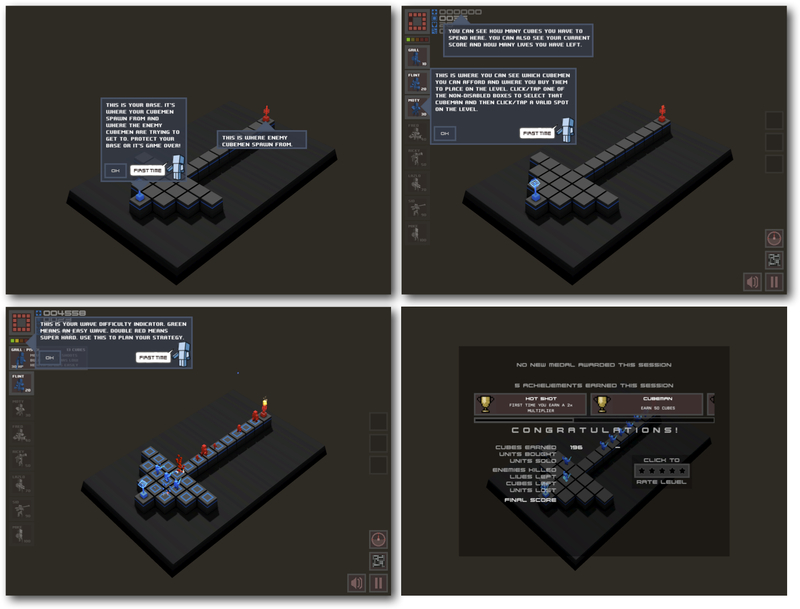 When playing in the single player tower Defense mode, you can further refine your gameplay by selecting one of six ways to play. You can choose the Classic play option, which ends after 20 waves; Limited Players, which limits the number of players you have on the board to eight; Limited Cubes, which limits the number of cubes you play on to 350; Just Rockets, where you can only select rocket Cubemen; the Endless play option, which is Classic with no limits to the waves; and finally Sudden Death, which is also like classic with only one life to lose. You lose a life each time an enemy player makes it all the way to your base. The main difference between Skirmish and Mayhem game play modes is that Skirmish is limited to a one-on-one battle, and Mayhem has up to six teams playing at once. Both Skirmish and Mayhem modes can be played offline against the computer, or online against other players. If there are not enough players online, Mayhem mode will fill the remaining slots with computer players. When you host an online game, you choose the battlefield and whether or not the game is public or private. You will need to have access to the internet in order to connect with the server and play with other players, even if you are on the same Wi-Fi network. What sets this tower defense game apart from others, besides the multiplayer aspect, is the fact that the levels are playable in all three dimensions. Each level is comprised of layer upon layer of cubes stacked up one upon the other. Tunnels, caves and even entirely separate floors can exist floating above and below you. On some levels this creates the opportunity for you to sneak past the enemy line, and attack from behind. Just keep in mind it also allows the enemy to do the same. There are 35 different levels to choose from in Defense mode, 25 in Skirmish, and nine in Mayhem. For Skirmish and Mayhem, it is clear that the levels were created with two and six teams playing against each other. If you get tired of playing the included levels, you can either make your own level with the level editor, or choose from the hundreds of levels created by other users. Each level is scored by users that have played the level. The game even keeps track of the number of times a level has been played to help give you a sense of how well the level was designed. Despite the low-resolution graphics in three dimensions that are the Cubmen’s world, there is a good amount of customization. 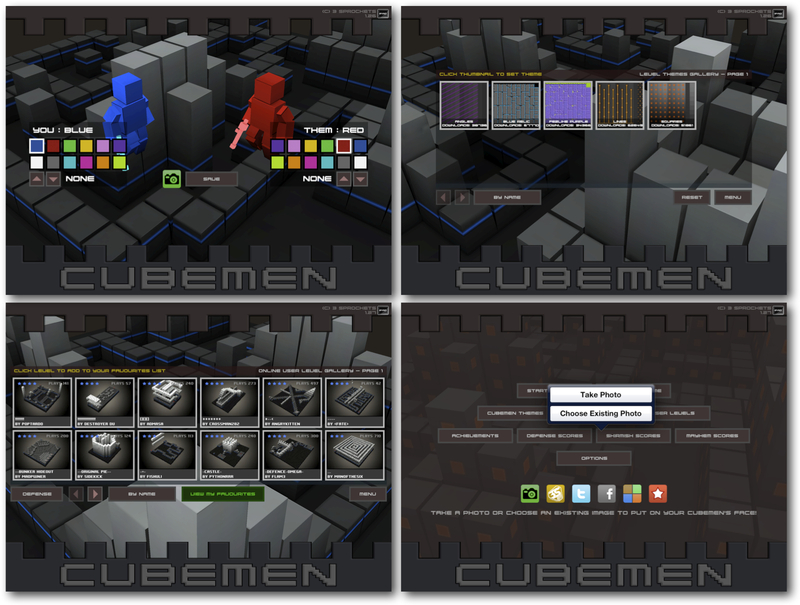 You can switch the colors of your Cubemen and even change the theme of the cubes used to make up the battlefield. There are different music scores to choose from, some of which are tailored to specific mercenaries like Ricky’s Theme. In the latest release on the iPad, you can even personalize the faces of the Cubemen on the battlefield by using a photo of your choosing.